Antonio Margolles. The Alphabet of Thought (With These Signs We¿ve Given Heritage of Our Incoherence), 2010. Interactive flash. Luis Gárciga, Yunior Aguiar, Grethell Rasúa, Renier Quer, Celia González, Javier Castro.10 detail 10. From the Ephemerides series, 2008. Video stills. 6¿02¿¿. Gustavo Romano. A Writer¿s Afternoon, 1998. Video still. 0:45¿¿. Ernesto Javier Fernández. 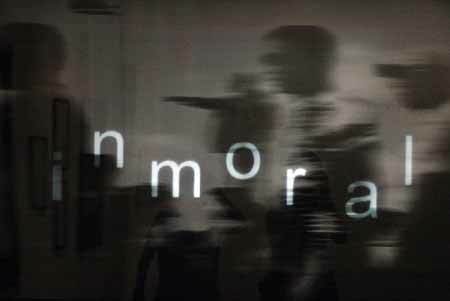 Inmortal/Immoral, 2011. Neon and photographic light box. Based on an idea by curator and art critic Elvira Rosa Castro-who worked in collaboration with three Cuban experts: Ibis Hernández, Margarita Sánchez, and Sandra Contreras-the collective exhibition Ya Sé Leer: Imagen y texto en el arte latinoamericano opened in late April at the Centro de Arte Contemporáneo Wifredo Lam and at the Villena Gallery in the Plaza de Armas, in Havana. Taking as its central focus the use of texts in the region's visual arts, the show-unencumbered with any attempt to historicize a phenomenon that has been present since the 1970s and exploded especially after conceptualism and regional trends rooted in the political and the social-was able to bring together works by 100 artists from the continent and its islands, after many documentary research explorations and personal experiences by the curatorial team. To that we must add the support offered by Havana-based institutions such as the Casa de las Américas and the Museo Nacional de Bellas Artes, as well as private collectors and several of the artists invited to participate. Although other exhibitions across the world have explored similar issues at a global scale, few have taken into account this wealth of Latin American productions, since the last quarter of the previous century a significant segment in the region's visual arts. The show was mainly focused on shedding light on the tensions that emerge from the complex relationship between image and text, the latter understood in some cases as a verbal supplement, and in others as a structural base and meaning-carrying element, a kind of ready text and even a non-text; this is to say, as a palpable, physical absence or something hidden at a given moment. These premises made it possible for the curatorial team to approach the phenomenon with flexibility from conceptual and ideological standpoints, conscious of the fact that the tensions could well be different if we take into account its expansion and extension in recent years. The team's initial research interest were prodded by Cuban experiences in the second half of the Twentieth Century, although at no point was the idea to produce a historical review of them in the country. What began focalized at that local level expanded rapidly to other areas in the region thanks to an interest in calling attention to a phenomenon that remains far from exhausted and underlines-or expresses itself boldly through-specific artistic practices as an attempt to achieve a greater degree of receptivity among viewers, provoke a higher level of reflection, and push, following Roland Barthes' suggestion, the rudimentary character of the image with regards to natural language in order to "question the linguistic character of the image", and in turn the image as a "site of resistance to meaning." Part of the team's enthusiasm about this relationship was also due to special exhibitions of works by important Latin American artist in successive editions of the Havana Biennial since the 1990s: Eugenio Dittborn, Clemente Padín, León Ferrari, Paulo Bruscky, Raúl Martínez, Luis Canmitzer, Claudio Perna, as well as other participants in the event's collective exhibitions: Germán Martínez Cañas, Pepón Osorio, Alex Flemming, Vasco Szinetar, Kuki Bneski, Patricia Furlong, A-1 53167, Rafael Lozano-Hemmer, Mónica González, Nelbia Romero, Christopher Cozier, Jarbas López, Oswaldo Maciá, Iván Capote, Alejandro Ramírez, Rivane Neuenschwander, Carlos Montes de Oca, Roberto Diago, Raúl Cordero, and Ryan Oduber, among others. In Cuba, this was the first attempt to articulate this interesting phenomenon at a partially continental scale, although the fact of its being held here signified a larger number of Cuban artists than those from other countries. For that reason, the show made it possible to bring together artists settled abroad in a way that hadn't occurred for years, such as Umberto Peña, José Bedia, Arturo Cuenca, Ángel Delgado, Carlos R. Cárdenas, Segundo Planes, Antonio E. Fernández, Glexis Novoa, Elio Rodríguez, Carlos Garaicoa, Alexander Guerra, Consuelo Castañeda, Inti Hernández, all members of an artistic diaspora that its renowned and deep, with others who live and work in Cuba. Their works conversed on equal footing with those that have become precursors in more than one sense: I am referring to Alfredo Sosabravo, Jesús González de Armas, Fayad Jamís, Santiago Armada, Raúl Martínez (the last three already deceased), who since the 1960s have proclaimed loudly the connection between image and text as the gain of a new spatiality in art, markedly bidimensional, at a time when the new Latin American cinema, on one hand, and conversational poetry, on the other, subverted established cultural discourses and reasserted the basis of similarly avant-garde artistic movements like, for instance, the experiences of Tucumán Arde in Argentina and, later, the CADA group in Chile. Equally encouraging, finally, was to see works by younger Cuban artists (in their twenties) who are already outlining revealing areas of the local visual scene, in full development and effervescence. In general, a good number of the works on exhibit persisted on variations (now updated, to be sure) of those complex relationships between text and image established since the 1960s, indebted above all to graffiti and Pop Art. Such familiarity, however, was no obstacle for the expression of the logical differences that have been appearing in certain practices in recent years. One of them resides in the emphasis given to the title of the work for the understanding of its true meaning, or at least to foster an interpretation closer to the desires of its creator. Another one is sustained in the use of new technologies that render the relationship more dynamic and move it towards a level of interactivity that was impossible to even imagine a few years ago: this is the case of works by Antonio Margolles (Alfabeto del pensamiento, 2010) and Rodolfo Peraza (Tetri Lego, versión 1,0: el encierro, art software from the series Juega y aprende, 2011, in ED. 5 + 2 PA), two Cuban artists with long experience in the field, whose obvious hyerarchization of the text in their drive to connect with the public made it the center of their operations. Something similar (but in a more conventional sense, given that it is a well known object) is what Reynier Leyva Novo (Cuba) does by showing 800 pages of a book placed on top of a wooden base, on which only the word Revolución, repeated hundreds of thousands of times, could be read; the public could peruse the book to the point of exhaustion. Also faithful to that preeminence to the verbal, to the linguistic, albeit not asking for any kind of interaction, were the photocopies presented by Argentinean artist León Ferrari (his extraordinary Laberintos 4 and 5, and Carta enigmática, 1980, small format), Costa Rica's Priscilla Monge with two Pizarras escolares, 2009 (finished in Havana by Elvira Rosa Castro, with the sentences I must not sleep with curators and I must not believe in good things), Cuba's Luis Gómez with his site-specific Would you like to buy my misery, 2011 (ax strokes on a 5-meter wall), and Uruguay's Patricia Betancur with her video I love to¿, 2008 (5 minutes). Luis Camnitzer, from Uruguay, exhibited two silkscreens from his series From the Christmas, 1970-71 (52 x 70 cm), with images taken from the well-known photographs of Che Guevara's corpse on display and an American soldier showing off to the camera his "war trophy" during the Vietnam war. Closely related, Argentina's Liliana Porter showed This is a woman, 1970 (silkscreen, 70 x 49 cm), whose central icon, taken from The New York Times, is the photograph of an old Vietnamese woman in terror at being pointed at the head by an M1 American rifle; under the image, we read in large letters the inscription this woman is northvietnamese, southafrican, puertorrican, colombian, black, argentinian, my mother, my sister, you, I. In both instances, the text contributes solidly to the meaning, a forceful element and ideological substratum that acts as a written image from a position of frontal dialog with photography. A diaphanous formal and linguistic eclecticism, from orthodox calligrams to audiovisual works, was evident in this serene, quietly variegated exhibition, free from boastfulness and baroquism, as many of the works included at no point threatened the balance of a graceful staging in order to explore-from the standpoints of culture and anthropology-this sector of Latin America's visual space, those orientations in an artistic culture that since the 1960s, and more intensely since the 1990s, wavers between an intelligent, sharp, warm post-minimalism and a contextual, heterodox, plural passion, all intent on constantly reformulating for us, their viewers, the central aspects of our individual and social imagination. Other proposals start from the platform of such an irradiating promiscuity. These are those cases where the text itself becomes the work of art: a tautological character that drives us to reflect on the interest and purposes of the artist. Written image or imagined writing? It matters not if both are fused into a single work of art, a single space, and nothing prevents us from reappropriating old notions in order to bring back the impulse given to this relationship-marked since the earliest Twentieth Century avant-gardes, and especially since Russian Constructivism-artists like Barbara Kruger, Joseph Kosuth, Joseph Beuys, Gary Hill, Ilya Kabakov, Dennis Oppenheim, Jean Michel Basquiat, and Jenny Holzer, among others. Bordering with this principle we find certain practices that move in much more complex directions, towards territories that are only tangentially connected to the verbal, even if we extend our understanding of that terms in its relation to the image. Along that path, we encounter works by Cuban artists Irving Vera (Una parábola, dos metáforas y tres símiles, 2010-11), Eduardo Ponjuán (Tranca, 2010, iron), Fernando Rodríguez (a video from the series Reflexiones visuales, 2009), Yornel Martínez (Árbol, installation with bonsai on a wooden ladder, 2011), perhaps suspect of an enthusiastic, all too rhizomatic curatorial interpretation that came close to opening itself up to the participation of tens, if not hundreds of works of art from the Latin American scene, in fact from any of our local scenes, which perhaps would have only served the purpose of validating the old saw about the exception and the rules. The curatorial excess was evident, in my view, in the inclusion of black and white photographs by Luc Chessex, a Swiss artist who lived in Havana in the early 1960s, him being a non-Latin American artist, someone outside the geographic reference of belonging to a specific context, even though his images are substantially key for an understanding of Cuba's reality and process of identity. The show was not about that. The range of such dissimilar artistic operations uncovered here, not only at the regional level but also within each country, is truly astounding, starting with the long roster of artists (100), more akin to those in the type of mega-show that are in fashion today. The galleries at the Museo de Arte Contemporáneo Wifredo Lam and the Villena Gallery promoted a search for works in small format and the inclusion of videos shown on screen that would make it possible to present in the museographic grid a larger number of artists active in the fascinating audio-visual universe. Several stood out: one devoted to remember the confrontational experience of the Havana group Arte Calle-in the midst of the crisis of the second half of the 1980s in Cuba-created in 1988 by Pablo Dotta (Uruguay) with the title of Viva la revolu. 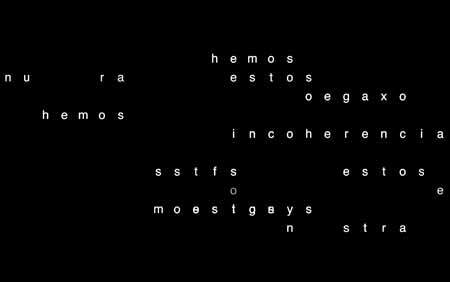 Another one created by Cuban artists Luis Garcia, Grethel Rasúa, Yunior Aguiar, Reiner Quer, Celia González, and Javier Castro, titled 10detalle10, 6 minutes long, 2008, which show frames of digital photo cameras at the scale of the video screen, where a variety of indistinct texts from messages of a personal, social, and especially sexual content: a collective work of art that displays audacity, wit, and humor with no constraints of hesitations. 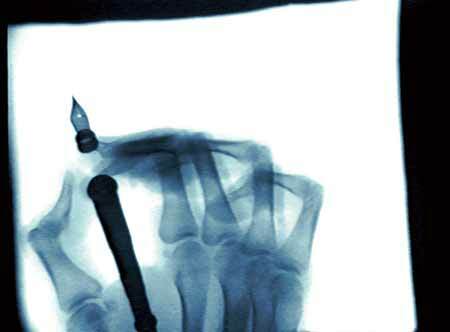 La tarde de un escritor, by Gustavo Romano (Argentina), 1988, is pregnant with emotional and poetic allusions: a loop recording the close up of a hand as it writes, using a stylographic pen, on a white sheet, through the projection of an x-ray image in which we can see the hand's bones and their movements while it attempts to set down a text that we cannot read. Its fascination resides, however, in the sound produced by the pen as it scratches the paper. In a general way, we are impressed by the museography in almost every space, as a meta-narrative intent on emphasizing the curatorial purpose and the desire to turn each wall into a kind of intervened urban space: thus our feeling of being both inside and outside the exhibition, which assumes the spirit of the city as part of the show's integrative concept. The climax is reached with BA LIBRE, mixed technique on a 3m x 1.80m wall, hung on the gallery like an urban ruin of a kind all too familiar in today's Havana. The text that gives this work its title, an implacable and heroic vestige of the phrase "Cuba Libre," painted at scale on a wall built by one of the youngest artists in the show, Rafael Domenech (Cuba), gives a new dimension to the central patio of the Lam Center, to the point of exacerbating its condition as a legitimizing space where the private and the public now fuse into a provocative political allegory. Both works (in large formats) move between two significant poles of contemporary Cuban history: official history and ideology, in a process of deconstruction, and a cultural policy that crumbles in the face of the imperatives of the attraction-rejection dichotomy with which it intends to "resist" the outside world. Voluspa Jarpa (Chile) establishes points of contact between those inside and outside spaces, or better yet: between the street and the conventional gallery, by displaying sheets of transparent PVC (Desclasificados, 2011) intervened with marker, on the glass that physically separates the Villena Gallery from the tree-lined, colonial Plaza de Armas. One reading, seemingly intimate and typical of a table-top kind of situation, opens itself up to the outside space in order to come to fruition in the attentive gaze of the public that walks around it: a paradox if you will, or a game to which the artist invites us in her drive to communicate. But not all was filtered through these new relationships between inside and outside space, because the museography in the galleries also favored simpler readings like those of commercial spaces, given the admixture and the proximity of many artworks, which presented, no doubt, yet another challenge to the ambitious goal of exhibiting one hundred artists.